The equipment was installed quickly once we decided to purchase. At Advantage Air Conditioning of the Treasure Coast, Inc, we can make sure that your air conditioner is taken care of properly from day one. Our air conditioning services include installation, replacement, repair and maintenance, and we spare no effort at making sure that our customers have what they need at all times. Let our trained and experienced HVAC technicians take care of your cooling needs. Call us today. Advantage Air Conditioning of the Treasure Coast, Inc provides air conditioning services in Fort Pierce, FL and the surrounding areas. It can be difficult to settle on an air conditioner for your home. Whether you’re starting out from scratch or you’re looking to upgrade your air conditioner, we can make sure that you have an excellent system in your household. We offer a diverse range of air conditioners, all built to last by leading manufacturers in the industry. Let us help you cool your home. If you’re looking for a highly effective cooling system, then you may want to consider a central air conditioner. Central air units cool your home quickly with an extensive network of air ducts, and they also pair nicely with furnaces for year–round comfort. We can make sure that your central air conditioner is appropriately sized and that it works well for years to come. Are you struggling with your cooling system? Do you want to make sure that your system is restored quickly and carefully? Give us a call. Our air conditioning repair service can bring your cooling system back to life. A heat pump makes a lot of sense in our area, and this type of system can take care of your heating as well as your cooling. 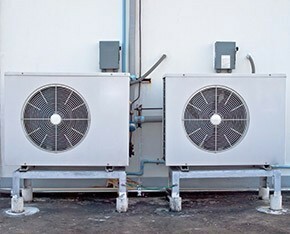 We install, replace, repair and maintain quality heat pumps throughout the area. If you want exceptional energy efficiency, then you may want to consider a geothermal heating and cooling system. They can keep your year–round comfort highly efficient so that you can save without sacrificing your comfort. Are you looking for a way to cool your living space while saving energy? We offer exceptional ductless air conditioning services. From installation to repair, we’ve got you covered. Why not make the sun work for your home instead of just heat it up? We offer solar air conditioner services, including the installation of new systems and the replacement of old ones. Reach out to our AC service professionals today for all of your cooling needs. We can bring your AC back to full working order, or we can make sure that your existing system is properly maintained. Call today.